Grapes are one of the ancient commodities, as they have been important to agriculture and human history for centuries. The growth of grapes and production of wine are rife with tradition. As a result, wine grapes are one of the least improved crops in modern agriculture. The wine industry’s strong tradition has growers in both the Old World (Europe) and New World (United States, Australia, New Zealand) producing primarily one wine grape species — Vitis vinifera. Although there are more than 10,000 varieties of Vitis vinifera to choose from, wine markets demand that only a handful of varieties are produced and wine regions challenge themselves to focus on one or few flagship varieties. Commercial grape production includes almost exclusively wine grapes, and only a handful of Vitis vinifera varieties are grown on a sizable scale. While Oregon is not a table grape industry, some small-scale producers are growing table grapes for farm markets. 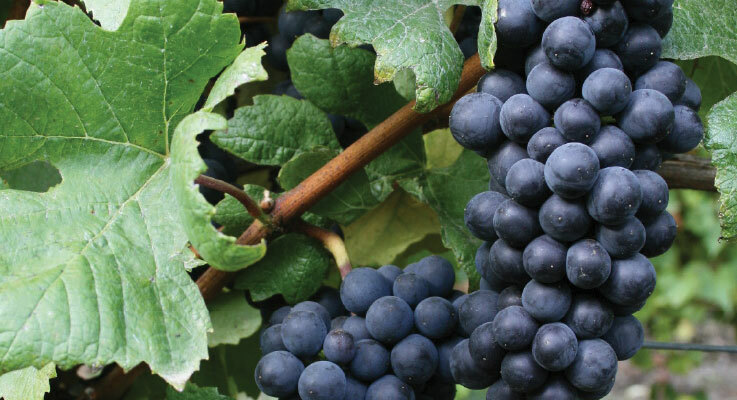 This article outlines the trends for grape varieties grown by commercial producers (large and small) and homeowners in Oregon with opportunities suggested for nurseries in making grapevine plant material available to Oregon producers. It’s all about Pinot Noir clones. 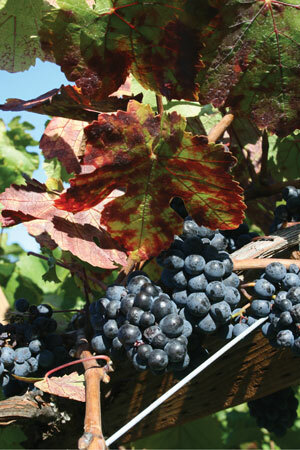 Vitis vinifera ‘Pinot Noir’ is Oregon’s flagship wine grape variety (Figure 1). It grows well under Western Oregon conditions and produces high quality wine for which the state is well known. As a result, there are more acres planted with Pinot Noir than any other variety, making up 58 percent of the total state acreage (University of Oregon 2018). If you ask a wine grape grower what they produce, they may list off clones rather than varieties. They rely on certain clones for specific wine quality outcomes. The Dijon clones (originating from France) are the most commonly grown in Oregon since the 1990s and include 115, 777, and 667. Many growers also produce the Pommard clone, which is cited as the clone that helped the early industry achieve wine quality acclaim. Other clones have piqued winemakers’ interests recently, including 90, 97 (Swan), and 37 (Mt. Eden) amongst others, as they seek to make their wines more distinctive. The challenge for producers is understanding the clonal characteristics, source, and availability. There is not much public information about the characteristics of each clone, and most information comes from winemaker experience. There are 156 Pinot Noir clones available at the Foundation Plant Services (FPS) Grapevine Program in Davis, California. They provide importation and plant material clean up processes to ensure that clean plant material (virus-free) is available to nurseries. However, it is important to note that many producers speak of clone based on their origin and not the FPS-assigned numbers, and there can be great confusion about clonal identity. Far more vineyards are being planted to Vitis vinifera ‘Chardonnay’ today than Vitis vinifera ‘Pinot Gris’, as there is a greater market for premium Chardonnay wines. Similar to Pinot Noir, winemakers are seeking to plant certain clones with preference for both French (Dijon) or American (California) clones. There are 120 Chardonnay clones available through FPS, many of which are clean and available to nurseries as certified stock. Again, the challenge is in understanding what the producer is seeking and cross-referencing this with the clonal identity upon completion of the clean-up process. In addition, there is some interest in planting Vitis vinifera ‘Gamay Noir’ and ‘Sauvignon Blanc’ for certain areas of the Willamette Valley. However, the demand is much lower than for Chardonnay. There is a small sector of the Oregon wine industry experimenting with wine grape production in Central Oregon. The challenges are many, given the region’s short growing season, seasonal frost events, and high daily temperature fluctuations throughout winter. Most Vitis vinifera varieties will not be able to survive these conditions. Specifically, they would not break bud late enough or ripen early enough for wine production in Central Oregon. However, some of the interspecific cold climate varieties bred by the University of Minnesota and Cornell breeding programs may be better suited to Central Oregon’s climate. There has been success in growing Marquette, Frontenac, Frontenac Gris, Vignoles and Foch, all of which are complex hybrids of Vitis vinifera and American Vitis species. They offer characteristics such as greater winter hardiness and shorter growing season requirements compared to Vitis vinifera. The availability of these varieties to Oregon growers is limited, and mainly nurseries in the East and Midwest produce these varieties but are not able or willing to comply with the current Oregon grape quarantine. There is a potential for local nurseries to produce some of these varieties in small quantities for growers in the Central Oregon region. I often receive homeowner inquiries about sourcing grapevines for home gardens or vineyards. Wine grape requests usually follow industry trends, with interest primarily in Pinot Noir, Chardonnay and others. However, these varieties are not available in most garden centers, and it is difficult to find a nursery that will sell small quantities or a single vine. Often homeowners or small-scale growers inquire about where to obtain cuttings for propagation, but we do not encourage that practice given concerns of the commercial industry about disease spread. Many of the issues with virus in plant material have been spread primarily by propagation with infected plants. When it comes to table grapes, the biggest limitation is the number of cultivars that will do well in Oregon. Many of the table grapes produced for grocery stores require greater heat units and longer seasons than available in Oregon. In fact, traditional table grape cultivars are grown in the hottest grape production regions of the world (California’s Central Valley and the Middle East). However, there are options for high quality table grape varieties for cooler climates thanks to the work of the University of Arkansas grape breeding program. The OSU Berry Crops Program has been evaluating the performance of some of the Arkansas releases and crosses amongst others in a table grape variety trial at the OSU North Willamette Research and Extension Center. These varieties are evaluated for yield, ripening ability, and resistance to cracking (due to rain) and are showing promise for small farms in the fresh market production. They are also more flavorful than the generic red or green table grapes found in grocery stores. There is an opportunity for nurseries to supply some of these new releases to homeowners and small-scale growers who wish to grow something more unique. Regardless of the grape variety, Oregon growers will soon be seeking certified plant material for their vineyards, farms, or home gardens. With the discovery of new grapevine viruses that can be damaging to wine quality, including Red Blotch disease (Figure 2) and Pinot Gris virus among others, growers are nervous about planting unclean (non-certified or non-tested) materials. Growers have not been careful about sourcing clean or certified plant material in the past and often would try to reduce planting costs by gathering bud wood and having custom grafting done from their local plant sources. However, the spread of these viruses has primarily been due to propagation with infected plant material. To address the growing concerns, we have been educating the industry about the importance of planting only “clean” plants that come as “certified” stock from the nursery. Certification can show that the plant material came from a mother source that was tested to be free of viruses and pathogens of concern. To further address this issue, the wine grape industry and academic partners are working with departments of agriculture in Oregon, Washington, and Idaho to achieve certification uniformity across the Pacific Northwest (Washington Wine Industry Foundation 2018). If enacted, all growers (commercial or hobby) will be required to plant only certified grapevines by the year 2023. Regardless of the rule changes, some commercial growers are currently seeking only certified stock for new plantings due to recent concern over virus-infected vineyards. Furthermore, LIVE sustainable certification of vineyards — the most common farming certification for Oregon — already requires its members to plant grapevines that are certified or have virus testing completed at the source prior to propagation. There is a growing opportunity for nurseries to provide the Oregon wine grape industry and the public with clean, certified grapevine plant material, and the ODA is currently working on certification standards for a local grapevine certification program. The wine industry’s biggest concern with the rule change will be the lack of sufficient stock available for new plantings. Certification programs take time to implement and generate sufficient tested stock to growers. Many Oregon producers currently purchase stock from California or Washington, but there is interest in buying locally (from Oregon nurseries) should there be sufficient stock available to meet production needs. Grapes are an important crop for Oregon. The wine grape acreage has nearly doubled in the past 10 years to just over 33,000 acres, and the future growth trajectory in the wine sector is strong. Having additional in-state sources of clean and certified grapevine stock for those growers, including scion and rootstock material, will be helpful for producers who wish to buy locally and alleviate supply chain shortages anticipated from producers across the West Coast. Understanding which “cleaned up” versions of wine grape clones are available is important to ensure that growers are getting the clonal material they desire without the viruses. Finally, there is opportunity for nurseries to consider offering table grape or wine grape varieties for small-scale growers or homeowners to allow a greater diversity for their farms, gardens, or landscapes. Foundation Plant Services Grape Program. 2018. FPS Grape Selections. University of Oregon Institute for Policy Research and Engagement. 2018. 2017 Oregon Vineyard and Winery Report. Washington Wine Industry Foundation. 2018. Harmonizing Clean Plant Protocols and Grapevine Certification in the Northwest. Dr. Patty Skinkis is an associate professor and viticulture Extension specialist with Oregon State University. She can be reached at patricia.skinkis@oregonstate.edu.